As I have happily been regaling my unhappy friends with recently, I bought a clock. I’m not entirely sure how I ended up buying a clock, but I was searching for some old book or other online and somehow a clock appeared, and it looked amazing. This majestic thing is the remains of a Lantern clock, a type of wall-hung clock popular in Europe from the early 17th century through to the early 18th. All I have here is the frame, formed of four pillars and the base and top plate, and the face. The winding hole in the front is later, and appears to be one of the remnants of it being converted to a mantle clock probably in the 19th century. Restoring it is a project for the winter. But who made this clock? Well, I’ve been doing some investigating. 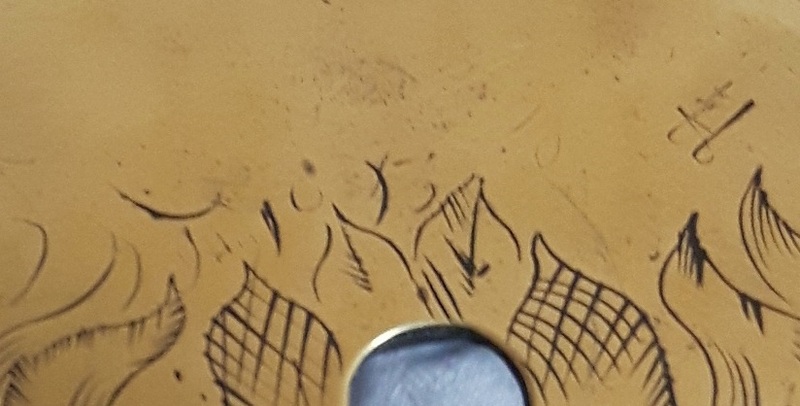 The top of the dial should have contained the answer – this is where clockmakers of the period would often engrave their names and the date – but it had clearly been the pride of some long-lost owner, who had polished away all but the date, Jan: 1693, and what appeared to be a double t at the right hand side of the inscription. 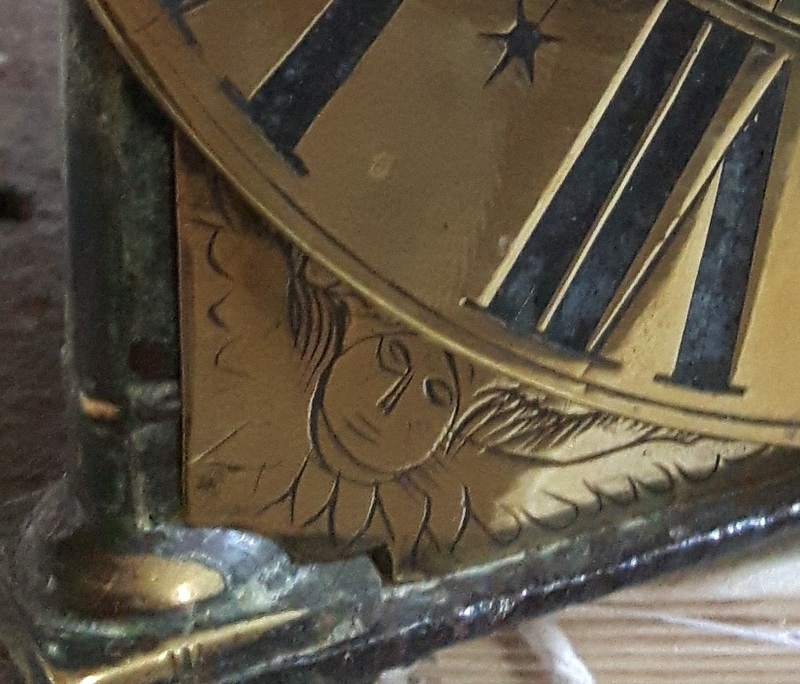 I immediately searched for all clockmakers of that date whose names ended in double t, there were several including a Stephen Wilmott who had lived and worked in London. There wasn’t much to go on, and I gave up for a while. 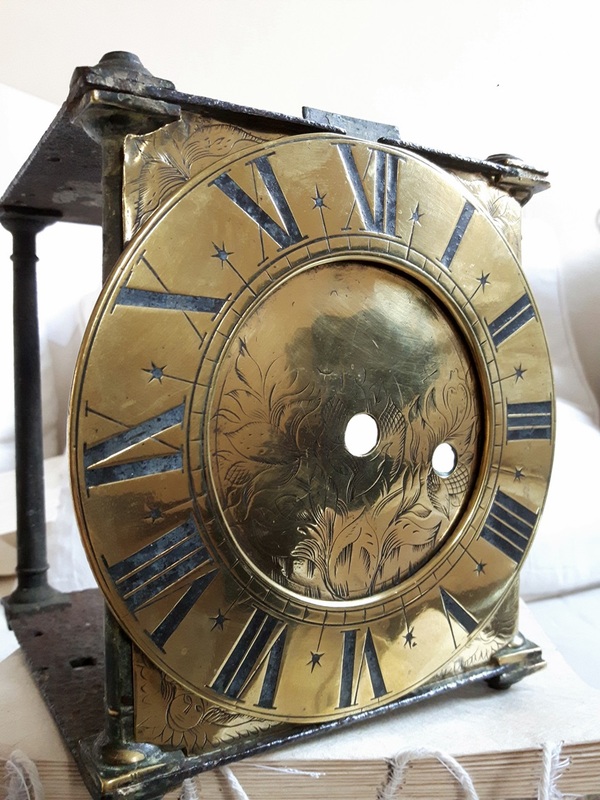 It wasn’t until very recently, when I was researching whether a brass or iron bell was more appropriate for the clock, that I came across an auction catalogue from 2015, in it was described a curious lantern clock of similar date to mine. 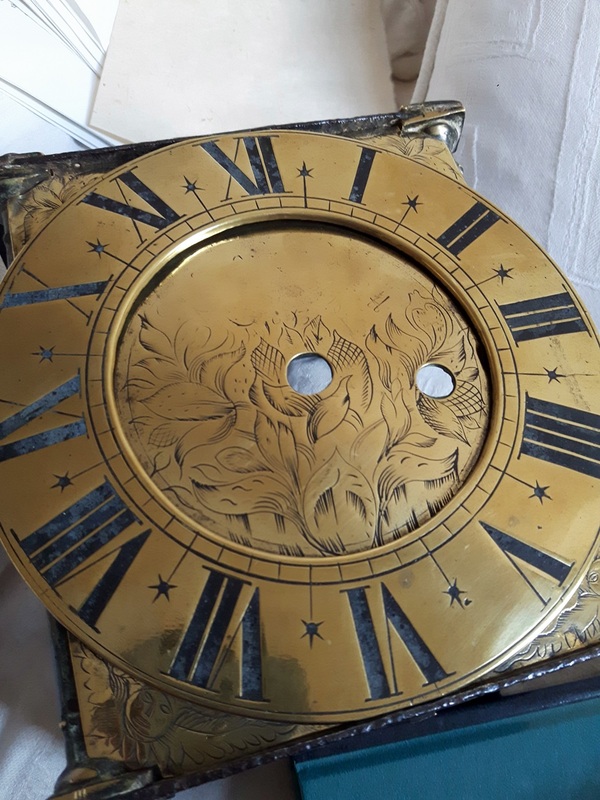 This clock was described as having cast iron plates at the top and bottom of the frame, the same as mine, and apparently this was a very curious thing – the usual metal being brass. One name was associated with this particular practice – Richard Savage. 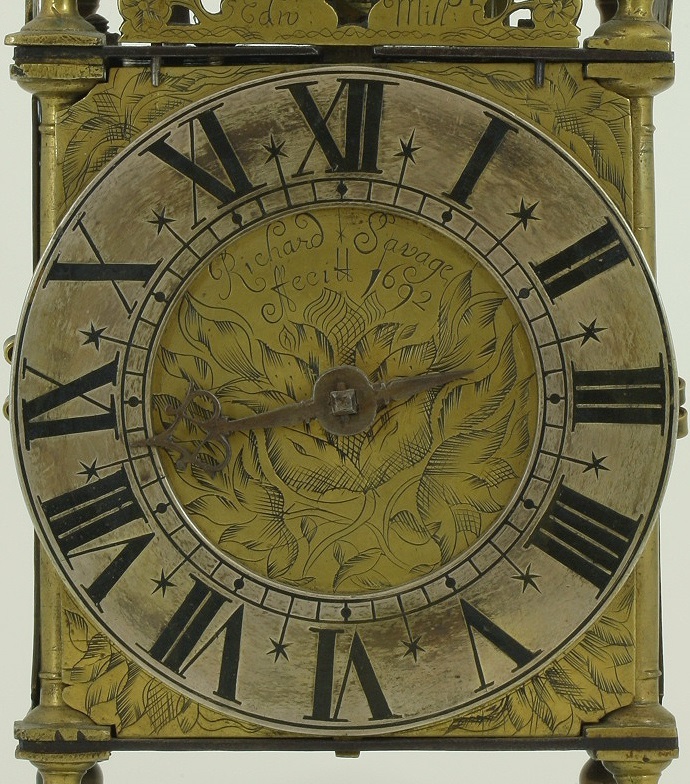 I immediately started researching his clocks and, amazingly, his engraving style matched that of mine perfectly – I had my clockmaker. One particular dial even had the same double t at the end of the engraving; it is in fact a tt at the end of a mispelled Latin word fecit. This would have accompanied the clockmaker’s name to proudly immortalise his making of it. Savage is known for his charming style, and one small detail that I love about mine that does not exist on the other clocks that I have seen is the small faces engraved under the chapter ring at the bottom of the clock – Savage was known to create clocks commonly as commissions for gifts; could mine be celebrating the birth of a child? Or the quick cartoons of a newly wed couple? Or they could just be cherubs, a pretty popular thing in the late 1600s. I’ll be posting a short biography of Savage soon.